May the true spirit of Christmas be with us all and May God gives us a fruitful and happy new year! From the bottom of our hearts, we thank you for being a huge part of our journey. You witness our children's growth, our ups and downs, and most especially our adventures as a family. We went on a short country road trip last weekend. Here are some chilly snaps I took. Enjoy! Normally, hubby would put our destination in our GPS so we won't get lost but this time we challenged ourselves. We said that we will just follow our instinct and just drive and enjoy the scenery. We did not find the property we were looking for but we have seen some amazing view with our trip. We all have that one friend who is absolutely obsessed with their vehicle. They constantly talk about it, have issues with anyone else so much as touching it and try to upgrade and personalize it at every opportunity. Likewise we have normally seen a few strange ‘custom jobs’ in terms of cars and motorbikes; swapping out normal black seats of the car for neon green leopard print, or engraving ‘Graceland 4ever’ on the back of their motorbike. So what about strange bicycles? Cycles have a long standing history of being comical. We have the ludicrously popular penny farthing in 1889, and unicycles are still frequently used as an accessory to juggling and comedy clown acts in circuses. So how about we have a look at some very strange, very uniquely customized bicycles? Todd Kundla created a bicycle made out of sticking old trainers onto metal poles. Although innovative, you wouldn't want to get your foot stuck under one of those wheels! A more stylish and colorful version was also made, this time probably from newer models. Made from a total of nine bicycles, this bike wasn't used much as a means of transport, namely because it’d be very hard to go anywhere. It was more used as a playground ride, or as a fun way to exercise in a group. One of the benefits of this bike is that you never fall over, but I wouldn’t use it as a way to get to and from the office quickly. Now there is an efficient way to do your weekly shopping without chugging the car to and from the supermarket. Be environmentally friendly with this swanky combination bike. However with only the back brakes available; make sure to take extra care on those bends, no use crying over spilt milk! What better way to show your love of foliage than to make a bike out of it? Camouflage yourself completely and take a cycle down to the woods to be completely in tune with nature. The tree bike has been carefully made out of old bits of driftwood and fallen trees, only carved where necessary. To make the handlebars, the owners have used twin branches from a fallen tree. Holly leaves accessorise the bike’s ‘naturalist’ look, and complete with soft mossy seat and pedals, this tree bike is bound to bring you back to your roots. And finally, the centrepiece of strange bikes. Believe it or not this is actually a bicycle! Yabba Dabba Doo? This homemade car/bike is very reminiscent of that lovable caveman family; the Flintstones. Built by a Canadian artist Michel Debroin in 2005, it was created using the skeleton of an old car, some bike pedals and a few old gears. There was also a special transmission, designed and installed into the car which combines the pedal power; that of up to four people, and transmits it to the wheels of the car. There have been claims that this car-bike can travel up to 15km an hour. Perfect for travelling to the Bedrock Bowl for a night bowling with the guys. Christine Thomas writes for a number of online publications on weird and wonderful things across the world and has contributed this post on behalf ofSummit Different, the online store for cyclists looking for cycling jerseys with a difference. I still have like 10% of the photos I have printed to finish for scrap booking. I have done the photo albums first and save the scrapbook for holidays so the kids can help me. Do you do scrap books? LEGO always comes up with unique and fun way of doing things for every family. 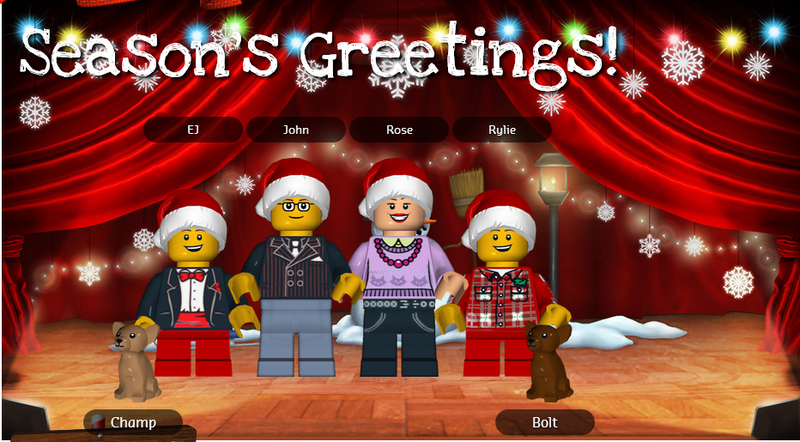 If you haven't made your LEGO Minifigure Family yet, I encourage you to do it, it is so much fun! Take a look at this one that I came up with. It actually took me a while to complete it because they have many selections for the torso, legs, heads, and hats designs that I had a hard time deciding which suits our own personality hahaha. This is so cool that I wish I could have done it when my kids are still awake, but hey, there is always tomorrow right? I know where to go now and where to create, so this would be a fun thing for us to do during the weekend. We love LEGO here at home. My son is very proud of the race car that he built out of LEGO. My daughter also love the set that we originally got for our son but it is a little bit complicated for him so for now, she helps him build it. I like it that the navigation is very simple and there are many selection and options in designing your holiday cards. Are you ready to make yours? My kids love seeing these big pipes from the factory that spits out smoke. I am not sure what factory is this from but it is the one from New Cumberland. Alright, I just want to post this real quick before I go to bed. I have to go to school tomorrow for the kids Secret Santa Shopping and I will help facilitate for the day. I was looking at the selection of raymond weil wristwatches and this particular one reminds me of the watch that my Dad used to have. It was a different brand but it is similar to this. Oh those memories makes me smile. Papa was very fond of wearing a watch, it was kind of like his signature bling. Oh I wish that life has a rewind button so we could still see our loved ones who have departed already. My husband is keeping up with his work out routine. His goal is to get down to 175 lbs and I think that he need to lose ten more pounds. Me on the other hand is not trying to lose weight but trying to tone down since I have a stubborn tummy fat that I am trying to get rid of for a very long time now. My digital scale needs a new battery so I need to buy it today. Summer is here which means the heat is on its way in. If you don’t have an air conditioner, it can be hard to find ways to keep cool. And even if you do, you may be looking to reduce the cost. Well, there are ways to keep cool without air conditioning. Follow these five steps for a cooler Summer. All you need is to think outside the box. So the fan is blasting in your face but it’s just not cooling you down enough – we’ve all been there. Try moving it around a bit and seeing what works best. By facing your fan out the window, you can help to blow the warm air out of this house. Similarly, if you can use an extension cord and place it outside the window facing in, you can blow the cool air from outside into your house. It seems too simple to be true – but it really does work. Keeping yourself as hydrated as possible will ensure you with a cooler and easier Summer. Whenever you find yourself becoming too hot, have some water. Keep this up throughout the day to fight off the sun’s rays. Make sure to carry a cool drink bottle with you when leaving the house. You never want to be dehydrated in Summer – it will only make you warmer. Maybe you’re thinking this is obvious, but a lot of people don’t really think about it. We’re used to slaving away over the stove or oven at dinner time, but we never quite think about how it will affect us in Summer. Well, cooking over a stove in the height of the heat is going to do you little good. Plus, eating hot meals can keep your body at a higher temperature for well into the night. To cool yourself down immediately and in the long run, cook and eat cooler meals such as salads and sandwiches. Modern lights can produce a lot of heat. In fact, incandescent light bulbs give off as much heat as they do light. If you’ve been keeping your lights on in Summer, this can be a huge factor in making you hot and bothered. This Summer, remember the affect that your lights can have on your body, and turn them off as much as possible. If you’re searching for a more long term solution to keeping the heat out of your home, consider installing attic insulation. Having an uninsulated attic can mean you are losing up to 20% of the cool air in your home. It may cost you a few hundred dollars straight up, but it will keep you cooler and be more cost efficient that air conditioning in the long run. Remember that there are many different ways to keep cool this Summer. All of the small things add up, and can leave you feeling more hot and bothered than you imagined. Drink water and turn off the lights and you will be feeling better in no time. For more information creating a cooler home, visit Coral Homes or Coral Homes on True Local .